By focusing solely on drifting rather than making it a sideshow mode shoehorned into a normal driving game like so many racers have attempted over the years, Absolute Drift: Zen Edition is immediately one of the best drifting videogames ever. No other game nails the feeling of sliding around just on the edge of control quite the same way Absolute Drift does. Feel is a bad way to describe a game, I admit, but Absolute Drift feels freaking great. It is also an incredibly satisfying challenge, too, as drifting can be very tough to master even if the controls are wonderfully intuitive. Once you learn how to play, though, Absolute Drift is addictive and satisfying and hard to put down. See our full Xbox One review for Absolute Drift: Zen Edition for more details. 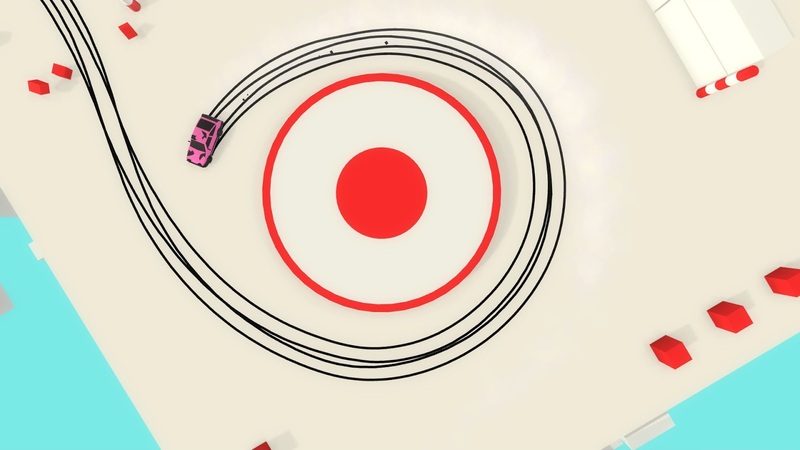 Absolute Drift is a driving game with a focus on drifting. What is drifting? Drifting is form of motorsport where the driver intentionally breaks traction in order to slide around corners and obstacles. It isn’t necessarily about speed and more about precisely controlling your car as you slide sideways as close to perpendicular as you can. The higher the angle you slide at, the more tire smoke you produce, and the closer to the obstacles that you can get while sliding without hitting them all contribute to your overall score. Style and looking cool is the key here. And it’s a hell of a lot of fun. Absolute Drift features simple black, white, and red visuals (though you can paint your car different colors) from a top down camera perspective. It seems like it is too simple compared to other racing games with more realistic visuals and camera angles, but the style works perfectly here and the controls honestly feel just like they do in any other drifting game. You have gas and brake on the triggers, steer with the left stick, and handbrake with the B button. It is all pretty intuitive. The controls are very sensitive, though, and learning how to break traction, feather the throttle and brakes, and precisely maneuver your car around each course is very challenging. You will crash. A lot. Constantly. All the time. But with practice you learn the proper lines, correct speeds, and how to play well and it is an extremely satisfying process that few other games can match. It also helps that the events are usually very short, and you can reset and start over with no load time (the load times are extremely fast overall here), so you can try over and over and over very quickly. This makes the game very addictive because you’re always itching for just one more attempt. Absolute Drift features a sort of career mode where you explore an open world and have to complete specific objectives to open up new areas. The objectives are things like drifting between objects, doing donuts in specific areas, jumping gaps, and other things. You can also access events at different points on the map. Completing the open world objectives is how you unlock new events and new vehicles to use. The cars are all based on real world drift cars (though without the licenses) and actually feel different from each other to the point that one might suit your personal driving style better due to more speed / different handling / etc..
You can also play through events from the main menu, which is what you’ll spend most of your time doing after you unlock everything. The open world can be “finished” in just a few hours, but the main point of the game is to keep making runs to improve your scores and climb the leaderboards. Anyone that is satisfied with making one run through everything and “beating” the game isn’t playing it right, honestly. There’s more than enough content here, and enough replay value, to easily justify the very reasonable $12 price tag. All in all, Absolute Drift: Zen Edition is an incredibly challenging, but awesomely satisfying and fun arcade-style driving game that I can’t recommend highly enough. I’ve always loved drifting in games, though, and “Tokyo Drift” is my favorite “Fast and the Furious” movie, so maybe I’m a little biased, but Absolute Drift just freaking nails it. It feels so good to play and has such a great art style and soundtrack that I just fell in love. Absolute Drift: Zen Edition on Xbox One is fantastic. Buy it.